You can use your favorite social networking applications like Twitter and Facebook on your Samsung Galaxy S5 for sharing contents and updates with friends, family and acquaintances. This guide will walk you through using Facebook on your Galaxy S5 handset. If you think you'll need further assistance in the process, then you can always refer to this content whenever you're ready. 2. Tap on Play Store. 3. In the Play Store screen, tap on the Search icon (magnifying glass image on the upper-right) to search Facebook app. 4. Now enter or type in "Facebook." 5. Tap to select Facebook from the given list of related search results. 6. Tap on the INSTALL button in the next screen. 7. Tap on the ACCEPT button to continue. 8. Once the download is complete, tap on the OPEN button. 9. You will then be prompted with the Facebook sign in screen. Tap on the Email or Phone field. If you already have a Facebook account, you may refer to the following steps to set up your FB account on your Galaxy S5. 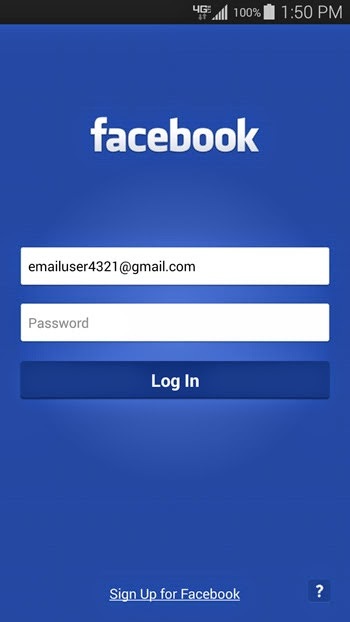 If you don't have a Facebook account yet, then tap on Sign Up for Facebook instead. Doing so will let you create a new account. 10. Now, enter your email address or phone number on the specified field. 11. Tap on the Password field, and then enter your password. 12. Once you've entered your password, tap on the Log In button. You should now be able to get in to your Facebook homepage. 1. Open the Facebook app on your phone. 2. Once you're in the Facebook app main screen, tap on Status. 3. Now, start writing your post or compose your status update. Anything you think interested or worth for posting. 4. Once you're status update is ready, tap on Post located on the upper-right corner of the screen. You can check out your recent posts/status updates on your profile page or home page. Follow these steps to log out of your Facebook account and exit Facebook app on your Galaxy S5. 1. Tap on the Navigation menu icon, from the Facebook app main screen. 2. Scroll down to and select Log Out. 3. Tap on Log Out . 4. When the Log Out screen prompts, tap the Confirm button to confirm log out. You now have successfully logged out from your mobile Facebook account.